"Solid Instruction on a Set of Routines and Some Basics, But Expensive"
Too expensive for what is provided. Unless you are die hard focused on 'routine style' game and a beginner, it's not good value for money - and even then. Looking at this because you want to learn about attraction? More suitable advice can be found in the top rated attraction courses ranking including those of Jason Capital, Bobby Rio and Mark Manson. 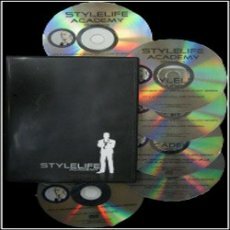 The content for the "Attraction Super Pack" was taken from some of the first seminars run for the Stylelife Academy Program. It's an assortment of repackaged content around the topics of routines and attraction. A downfall of this is that there is some time wasted on individual coaching of students on some of the audio calls that will not be useful for you. On the "DHV (Demonstrate Higher Value) and rapport building" CD nearly 10 minutes is spent on discussing the last 'mission' that was set to one of the students. The DVD on "Reading People and Calibration" also had some seminar fluff that got me wanting to fast forward - the group exercises of reading other students weren't very useful. The rest of the DVDs and CDs have much less time wasted. There is a lot of time spent on describing, demonstrating and talking about the details of delivery of some of the most popular and widely used routines from the pick up artist community. Some of the routines covered include those mentioned Style's book "The Game". Routines covered include: the best friends test, the ESP routine, the ring finger routine, the C vs. U smile routine, Style's EV (eliciting values), the Secret Self routine, the Evolution Phase Shift routine and the David Bowie opener. About half of the content in the "attraction super pack" is covering these routines. The point here is - if you want to use routines and learn to deliver them properly this content from Style is all you'll need to use these particular routines effectively. Also, since Style discusses the routines in such depth it will give you a good foundation from which to learn to use other routines effectively. What I liked about the content overall is that Style "gets to the point" of most subjects covered, explaining them well and keeping to what's important (instead of fluff). Also, he doesn't just teach what to do, he explains why it is important and what it really means. This provides a better foundation to enable the students to self-learn after, by helping them to really get it. He doesn't waste time on explaining or discussing anything that won't improve your results. High marks for keeping focused on what really helps someone to improve, and limiting the fluff. Style is arguably one of the best instructors/ gurus in terms of his own 'Inner Game'. As a consequence a lot of the attitudes and approaches to learning he talks about throughout the "attraction super package" are extremely useful. These points are woven within the DVD and CDs, and often brought up as side notes to something being discussed or when he is giving some feedback to a particular student. My fear is that these 'gems' may be lost on beginners. They may not realize how useful these points are. I found this content extremely basic. It was short and most of it was common sense, so if you have a lot of common sense - this won't add anything for you even if you're a beginner. If you are interested in 'storytelling' there is much better advice out there - The Magic Bullets Handbook has a much more useful section on it for instance. The content in this pack is ok for beginners who want to learn to use 'routines' and a traditional pickup artistry approach to attract women. The best part is that Neil Strauss provides some of the most detailed and solid instruction available on how to use a selection of routines. It is expensive for what it is compared to other courses - you are paying a lot of $$$ for this advice and instruction. Beyond this there are better courses. If you want to learn the traditional pickup artistry approach there's more value and a comprehensive look into it with the Magic Bullets Handbook. If you wanted something specifically to help you with attraction then the top rated attraction courses such as those of Jason Capital, Bobby Rio and Mark Manson are more practical and better value for money - see here.